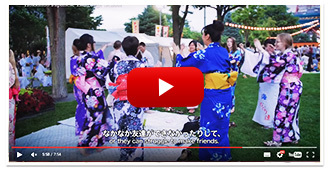 The Hokkaido JaLS Internship Program (Internship Program) is a unique combination of language learning and work experience that guarantees to prepare you for employment in an international environment and offer life changing opportunities in Japan. Our commitment to you is simple. We will Engage you in active learning and practical work experience. Equip you with the language and business skills you need to be successful in an international environment. Support you to have the best experience possible. Release your potential and confidence. You will take 15 Lessons and have 20 hours of internship experiences in one week. ※■ and ■ parts are all included in the fee. ※Participating in after school activities or the one-day trip on Saturdays are free to choose. ※Some activities will cost additional fees. A minimum of 120 hours internship experience. A minimum of 6 hours personal supervision and job training. A minimum of 8 hours personal supervision and job training. A minimum of 240 hours internship experience. A minimum of 12 hours personal supervision and job training. A 26 week or longer term program is feasible if you have a suitable visa. Please contact us for more details of price and arrangements. – A full company induction and access to training relevant to your role, including an Intern Orientation Day. – Support for your personal development from an experienced Line Manager. Tailored workshops on writing a resume, applications and interview skills in Japan and overseas. – Insight into a real Japanese business environment, and the wider educational sector. – Opportunity to build a network of colleagues within the sector. – Chance to be a part of our intern led development boards and organize additional events. – Access to our internal vacancy lists. Please refer to the housing on our main page. We can arrange homestay, share house or private apartment accommodation for our Standard ＋ Internship Course students. No deposit is required, and all options are fully furnished and include all service charges. To apply for Standard ＋ Internship Course we ask that you use our online application. Please select Standard ＋ Internship Course from the course selection list and choose your required accommodation. Once we have received your application we will contact you, and ask that you submit an up to date resume and an additional cover letter outlining why you would like to work in Japan and what the experience would mean to you. What kind of visa do I need to come to Japan? Our fees include all your Japanese Language Course and all study materials. Our fees also include a support package that takes place throughout your internship, 24 hour emergency support, job training and workplace preparation. If you choose our housing option, then your fee also includes all housing and associated costs such as household wifi, heating and water. Hokkaido JaLS can organize homestay, share house or private apartment accommodation for IP students. All accommodation is conveniently located within a 20-30 minute commute of the school. What is a Standard and Internship Course at Hokkaido JaLS? Our Study and Internship Program is a 6, 8, 12 or 26 week course offered by Hokkaido JaLS. In the mornings you will study Japanese. In the afternoon you will intern within our own company or with one of our partner placement organizations. Our internships will provide you with valuable skills and experience to add to your resume and give you a unique experience of working in Japan. How long is a volunteer internship? We aim for an Standard ＋ Internship Course to be between 6 and 26 weeks however, within reason, we will try to be flexible. If you are unable to commit to one of these time periods, just make it clear on your application and if possible, we will take this into consideration. Internships will be for at least 4 hours each afternoon. The scheme is aimed at undergraduates, graduates and those looking to change careers. If you are looking to gain valuable work experience and particularly experience of working in Japan, then this may be the scheme for you! We offer a variety of different roles that can suit different levels of experience and education. Our minimum age requirement is 18, and we have no upper age limit. We appreciate any voluntary or previous work experience you may have had but don’t worry if you don’t have any. We know that many applicants apply for a volunteer internship to get the work experience they need to kick start their career. The most important thing is that you demonstrate in your cover letter how you would make the most of your time on our Standard ＋ Internship Course by drawing on any experience you have had. To apply you will need to complete our online application form. Following this, we will contact you and ask you to send an up to date resume and a cover letter detailing the reasons that you would like to take part on our Standard ＋ Internship Course and why you would benefit from the opportunity to learn Japanese and intern in Japan. For some internships we will also need to have a short interview over skype in order to gauge the suitability of the placement. What level of responsibility can I expect to have during my Standard ＋ Internship Course? Our interns are given genuine responsibility and real projects to work on. We recognize that your decision to do an internship with us is an investment in your future career and we want to ensure that this decision is justified. Is the Internship Program full or part time? Our Standard ＋ Internship Course is full-time, combining intensive Japanese study each morning, with the chance to intern in an industry sector of your preference in the afternoon. Where is the Standard ＋ Internship Course based? Our Standard ＋ Internship Course is based in Hokkaido JaLS, a 5 minute walk from both Odori and Sapporo stations. All Standard ＋ Internship Course internships are unpaid. However, expenses for company related activities will be refunded. Can a Internship Programu lead to employment? As an intern with us, you will have access to our internal vacancy list and be able to apply for any opportunities within the company. We will also support you locally to meet relevant business contacts and be a part of our wider network. Will you provide me with a reference when I leave? Of course. A full reference, and any relevant paperwork for your university will be fully completed before you finish your period of internship. Is it possible to intern with Hokkaido JaLS directly? Our Parent Company, Hokkaido Global Linx is a growing and vibrant organization and we can offer a variety of internship opportunities to reflect this diversity. Innovating and piloting new community development ideas and events. Exploring new fundraising ideas and considering business development. Supporting our school marketing in Japan and abroad. Using their language skills to run events for our international and Japanese students.